﻿ A Minneapolis Twin Cities Minnesota Chiropractic Stretching Tips page. 1. The first thing to remember when starting a stretching program is that the goal is to increase flexibility and functioning of the muscle. We are not trying to inflict pain. If you are feeling pain during a stretch there are a couple of things you can do. First try decreasing the intensity of the stretch by not going into the stretch as far. If there is still pain, then stop doing the stretch and ask your doctor what you should do. Stretches can be modified by your doctor so that they are not causing any pain. Note: While we don’t want to feel any pain, the stretch should be a little uncomfortable. If there is no feeling of tension or a slight ache (but not a painful ache), then the stretching is not being done effectively. 2. Always follow the instructions given to you by your doctor. There are some general "rules" that you can follow, however, if you are stretching on your own. Hold the stretch for 20-30 seconds, without bouncing. If the stretch isn’t held long enough, it will not be effective. If the stretch is held too long, or done with bouncing, injury could occur. The more often you stretch the more effective stretching will be. You don’t, however, start out by stretching four times a day. Start by stretching once or twice a day and gradually increase the frequency as your body adjusts to the stretching program. 3. It takes one to two weeks of stretching before you will note any changes in flexibility or function of the muscle, so don’t get discouraged if it seems that the stretches are not working. It is also important to be patient with yourself; don’t push too hard because the stretch is not working fast enough. 4. Remember there is always another way to stretch the same muscle, so don’t let yourself get bored. Stretching can be fun, and having a wide variety of stretches will help you keep your interest and motivation to continue stretching. You can always ask your doctor for another stretch, a different version of a stretch, or even for an opinion on a stretch you discovered yourself. 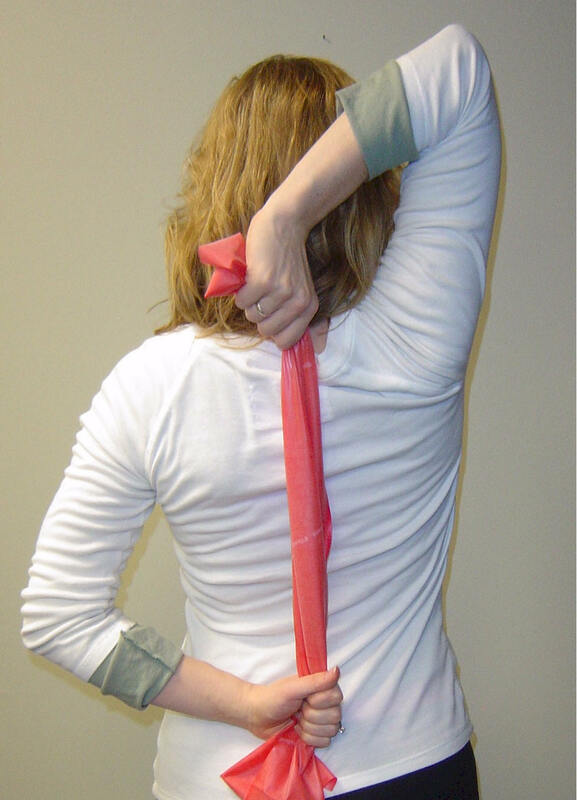 This stretch will relax several muscles surrounding the shoulder. Here are two different ways to do this stretch. The stretch on the left is easier to do and is easier on your shoulder joint. If you have ever had shoulder problems I recommend doing the stretch as shown on the left. It is important to keep your head neutral and gaze straight ahead. This stretch is good for anyone who uses their hands or arms a lot. Working with computers, working at a checkout counter, knitting, playing musical instruments, playing tennis, and many other activities, can cause your wrist flexors and extensors to become tight and problematic. Note: The elbow is fully extended and arm is straight on the side that is being stretched. The flexor stretch is shown on the right with palm up, and the extensor stretch is shown on the left with palm down. For this stretch it is important to make sure that your back is flat as you lean forward. Also, hard to see in this picture, is that there is no pressure put directly on the knee joint. Light pressure is put both above and below the knee joint equally at the same time, on the knee of the foot that is not on the floor. The leg on the floor: knee should be at a 90 degree angle, the knee should be directly over the ankle, the toes should be pointed straight ahead. This is great to do at your desk! It is important to note that in this stretch the non-weight bearing upper and lower leg are lined up (front view). The foot is touching (or almost touching) the buttock and is not off to either side. The bent knee is aimed straight down. The foot that is bearing weight, is pointed straight ahead. If you can not yet reach your foot in the back, wrap a towel (belts and ropes also work) around your ankle and pull in the same direction that you would if you could grab your foot. For athletes and people who have been stretching for a long time and under supervision, there are other techniques that can be used. Dynamic stretching, contract release stretching, and more advanced positions can all add difficulty, challenge, and fun to a stretching or flexibility program. For a link to the Yoga Center go the the links page here.